Downton Abbey. 1600x900 wallpaper. Took ages to cut out around the characters. The picture of the sky puncak, atas left is my own :) Hope anda like it :) :). HD Wallpaper and background images in the Downton Abbey club tagged: downton abbey season 1 costume drama mini series. 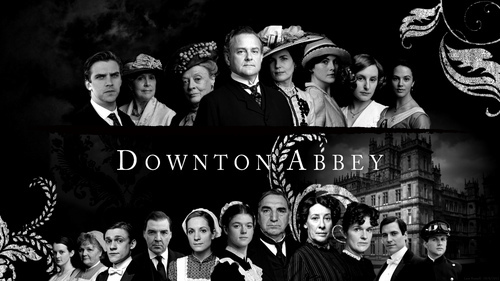 This Downton Abbey wallpaper contains konser, setelan jas untuk bekerja, and setelan bisnis. There might also be tanda, poster, teks, papan tulis, berpakaian orang, jas, celana jas, celana panjang, orang berpakaian, perapi celana, anggota orkes, and bandsman.